Manchester United caretaker manager Ole Gunnar Solskjaer has confirmed Alexis Sanchez will be out for between four and six weeks with a knee injury. The Chile forward was forced off in the second half of United's dramatic 3-2 win over Southampton in the Premier League on Saturday after a collision in the Saints penalty area. Speaking before United's Champions League last-16, second-leg tie away to PSG on Wednesday, Solskjaer said: "It was a bad knee injury, so it's four weeks or six weeks. Hopefully he'll recover quickly." 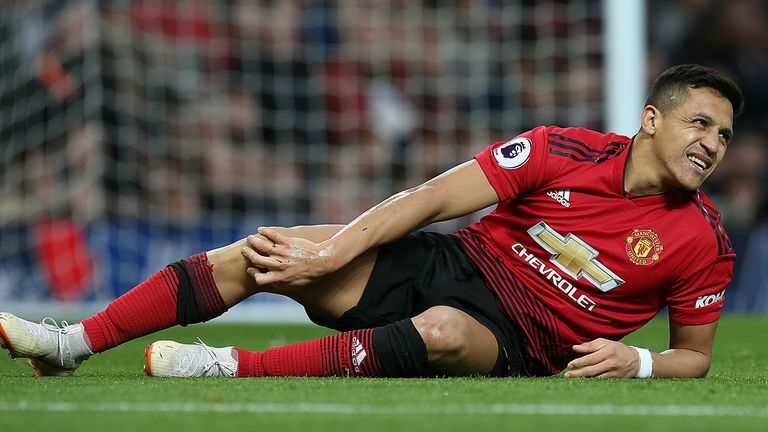 As well as the clash at the Parc des Princes, Sanchez will also miss United's match against his former club Arsenal on Sunday - live on Sky Sports - as well as the FA Cup quarter-final against Wolves later this month. Solskjaer's diagnosis is not as bad as the one given by Chile national team doctor Pedro Onate, who previously said he believed Sanchez would be out for between six and eight weeks. The 30 year old has struggled to make an impact at Old Trafford since arriving in January 2018, and has scored just twice in 23 appearances for United this season.